Welcome to my online fiction site! On this site you can read my online novel inspired by the game "Baldur's Gate II - The Shadows of Amn". This is unofficial site and it is not associated by any means with Interplay, Bioware or TSR inc. No material from this site can be reproduced for any commercial use and any noncommercial use must be authorized by me. The Story is not the only novel about Baldur's Gate game published on the gamejag site. You can access other novels from the side applet menu. If you liked mine, you can leave me a note in Leo's guestbook. by selecting the guestbook link on the left side menu. September 14 2002, minor revision of Chapters 16,17, 18 of Part 2 ( grammar, etc.) Some new lines added to Ch. 17 Thea musing about Raelis part. Sorry folks! I was on vacation in Rome from August 31 to September 12 2002. August 30 2002, Chapter 18 of Part 2 is added. July 30 2002, Chapter 17 of Part 2 is added. All the art by Andreas is now featured on the Gallery page. June 8, 2002, Chapter 16 of Part 2 is added to the Mirror site. May 18, 2002, Chapter 15 of Part 2 is added to the Mirror site. May 16, 2002, Baldur's Gate Art Gallery link is added to the Mirror site. May 3, 2002, Chapter 14 of Part 2 is added to the Mirror site first. I also added a link to the Mirror site on www.onlinefiction.net/TheStory/Introduction.html so that I can update the novel more frequently when Leo is too busy. He will still post new chapters on the gamejag page, but I will have more flexibility with the Mirror site! April 21, 2002, Chapter 13 of Part 2 is added. April 3, 2002, Chapter 12 of Part 2 is added. March 16, 2002, Chapter 11 of Part 2 is added. February 17, 2002, Chapter 10 of Part 2 is added. I also wrote summaries for each Chapter of the novel and formatted the main menu , so you can see them if you bring your mouse pointer over the blue ankh logo. January 27 2002, Chapter 9 of Part 2 is added, Chapter 8 of Part 2 is updated (mostly grammar and punctuation). Chapter 3 of Part 1 was re-written after the Imoen's Diary. I also revisited first meeting with Yoshimo. January 16 2002, Chapter 8 of Part 2 is finally finished. I have to apologize for the delay. Some unexpected events in my RL prevented me from spending enough time on writing. I would appreciate if you send me your comments on this part, as I did not have much time to 'fine-comb' it for grammar and punctuation. November 25 2001,Chapter 1 of the Part 1 was revised again. The changes are minor, but I felt like re-reading and correcting some of the scenes. The most significant change was addition some more background to the Minsc-Boo relationship. November 1 2001, Chapter 7 of the Part 2 is added. Some new formatting. Now you need to click on the link to the Table of Contents from each page to be able to get to the Main Menu. October 11 2001, Chapter 6 of the Part 2 is added today. Also, one of the readers sent me his drawing of the main character's porttrait. I liked it! So here it is. My thanks to Andreas! Chapters 3,4 and 5 of the Part 2 are now available. I did extensive formatting of the whole novel. But no changes to the text of Part1 or Introduction were made on August 29 2001. Chapter 2 of the Part 2 was added. Some minor corrections were made to the Chapter 1 of Part 2 on April 2 2001. Chapters 1, 2 and 3 of the Part 1 were revised on March 15 2001. 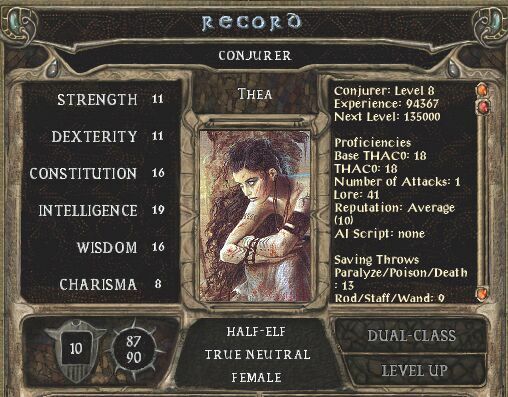 The changes were made to follow the official lore of the Forgotten Realms in matters related to the Magical Radiation and the person's True name. I also did some minor revisions in dialogs to better fit the main plot line. If you find any inconsistency in the plot of just want to make a comment or help me with correcting my grammar, please do not hesitate to send me email or post a message on the Attic messagebord. I want to thank everybody who kindly provided their input and help with the novel and assure my readers that their opinion always matters a lot to me. What is the alignment and the stats of the main character? Copyright © 2001 by Janetta Bogatchenko. All rights reserved.